Ginger supplements are something that everyone should always have on hand as they have so many amazing uses! Whenever you would use aspirin or Tylenol you can avoid the serious side effects of those painkillers and use 3 ginger capsules instead. Ginger is a natural anti inflammatory and antispasmodic so it works wonders for menstrual cramps. You take 3 capsules twice per day 3 days prior to your cycle and continue taking it during your period. As a Naturopath I've helped many of my clients alleviate their menstrual cramps using a ginger supplement. The ginger was so effective they also had many of their colleagues and friends order ginger pills from me. Ginger is safe for children. One of my friends was taking her son and his friend for a vacation by plane. The boys were 8 years old. His friend's mother said, "Kevin always gets sick on planes, he will definitely throw up." So my friend gave him a ginger supplement and he was fine, no motion sickness at all. His mother was so surprised. She gave him some ginger next time they traveled and he threw up. Why? She had bought a brand of ginger that was not from a reputable company different from what I sell. Quality is key! An adult can take 2 capsules of ginger pills before leaving and 1 capsule every hour as needed, although with a good quality ginger product, more may not be necessary. You can even take ginger after vomiting, it will still help. Ginger supplements are especially beneficial when digestive upsets are related to stress. It helps the stomach secrete digestive gastric juices to aid in digestion. It is also a carminative which means it helps relieve gas in the digestive tube and alleviates cramps due to gas. It helps relieve over acidity, working as an ant acid. In this way a ginger product is good for headaches when they are due to congestion, especially excess nervous congestion from stress. It removes blockages in the lymphatic system and the blood. Ginger is contraindicated with stomach ulcers as it increases gastric juices. Always take your ginger pills with a full glass of water, and you can even follow that with a second glass of water if you like. 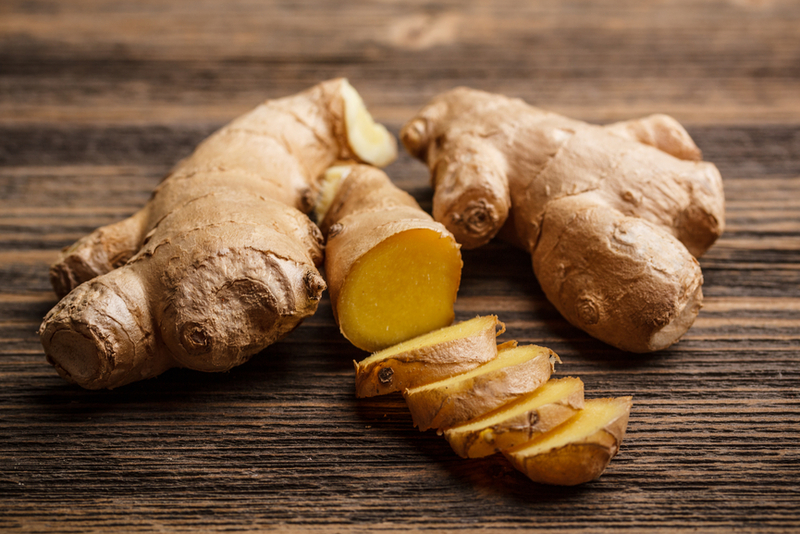 Ginger is strong, so you want to make sure it goes down into your stomach and does not come back up as it may cause a burning sensation if it does. Good for cellulite. Helps circulation of the lymphatic system. It is often used in herbal combinations as it is a catalyst. it helps circulation, so it transports nutrients through the body. For a twist, pulled ligament, or swelling. Open your ginger supplements, take the ginger powder and mix it with a little hot water to form a paste. Put it over the wound covered with gauze. This will help the circulation and the swelling will go down. For full medicinal effect, take a capsule of high quality ginger and open it in a cup and pour boiling water over. You can also make a ginger tea that might be less effective but still taste good by peeling and slicing some ginger root. Place in a mug with boiling water. Add in some freshly squeezed lemon juice and a little honey. The longer you leave the ginger in it the stronger it will get. Absolutely nothing better for a cold. You can see now why it is important to keep ginger on hand! And the best news is that good quality ginger supplements are not expensive.